iRig MIC Cast is the ultra-compact, portable voice recording microphone designed specifically for recording podcasts, interviews, lectures, voice memos, speeches and more. 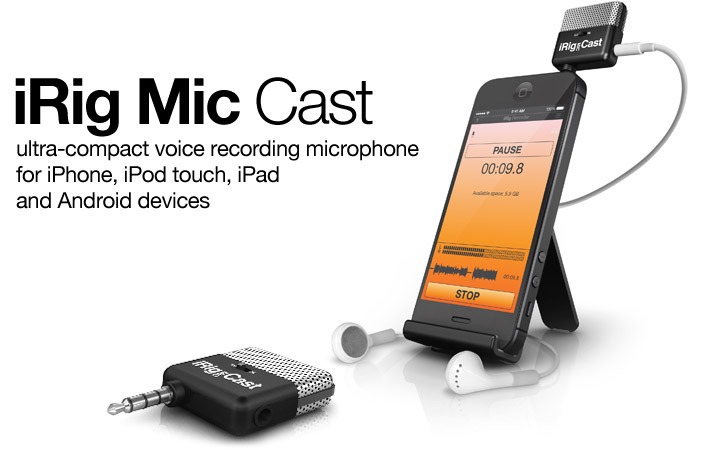 iRig MIC Cast provides a pocket-sized voice recording solution with crystal-clear audio quality. It features a tight unidirectional pickup pattern that minimizes background noise, making it ideal for single-source audio recording. This makes iRig MIC Cast also great for business applications like recording meetings and enhancing the audio and voice quality of conference calls. Features a stereo mini-jack headphone output enabling real-time monitoring of what is being recorded using headphones or speakers. One of the most frustrating things about portable mics is the inability to get good clear recordings from sound sources that are not close to you. iRig Mic Cast solves this problem with a dual gain switch that allows you to capture up-close audio as well as audio from sources not so close. 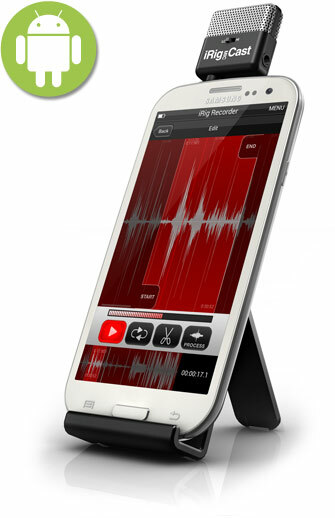 Now you can set up your iPhone or iPod Touch and record hands-free thanks to the included tabletop stand. Simply place the stand wherever you need it, put your iOS device in and hit record. Set up is easy: Plug the iRig Mic Cast into the headphone out “TRRS” jack. You’re now ready to record. Plus, iRig Mic Cast comes with two apps for recording and sound processing: iRig Recorder – a simple, no frills high quality recorder, and VocaLive – our professional vocal processing, effects and recording app. 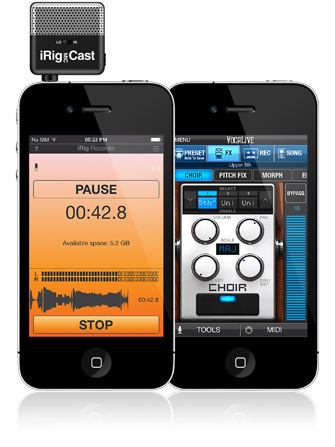 With iRig Mic Cast, making outstanding quality recordings is literally as easy as opening an app on your iOS device. 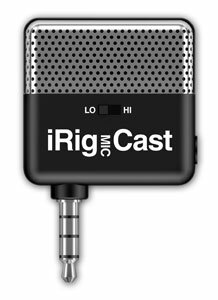 iRig Mic Cast is compatible with all iOS Devices with a headphone/audio in TRRS jack, like iPhones, iPod touch and iPads. And, you can use the iRig Mic Cast as a hands-free calling microphone for conference calls and speaker phone applications. Plus you can rotate the iRig Mic Cast to get the best capture angle, increasing the quality and fidelity of your recordings. 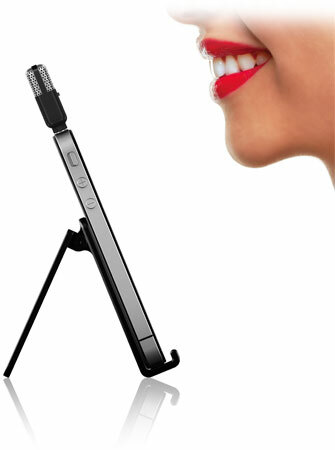 Now you can plug the iRig MIC Cast into your Android device and capture stunning high quality audio. Use the iRig MIC Cast and your favorite Android audio apps to capture podcasts, lectures, speeches, interviews, concerts and spurts of creative brilliance. iRig MIC Cast is fully compatible with most devices and apps that support and process audio — apps like Skype, Tune Me, the Booth Rap Studio, Voice Pro just to name a few. No additional software is required, simply plug iRig MIC Cast into your 1/8” (3.5mm) headphone/input jack and launch your favorite app. Also, iRig MIC Cast comes with iRig Recorder FREE for Android, an extremely easy to use intuitive audio capture and processing app that will quickly become your “go-to” app for quick audio recording.